Each mug of coffee will give you +42 experience points! 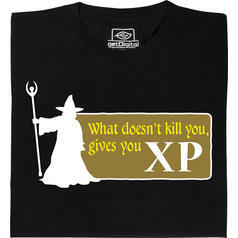 Shows a wizard and the slogan "What doesn't kill you, gives you XP"
Usually, role-playing games are just about exploring new worlds, beating up orcs and spending a nice evening with friends either at the pen-and-paper table or in front of your computer. But at times, a powergamer manages to sneak into your friendly group, a type of player that wants only one thing: to gain as much XP as possible and level up quickly! 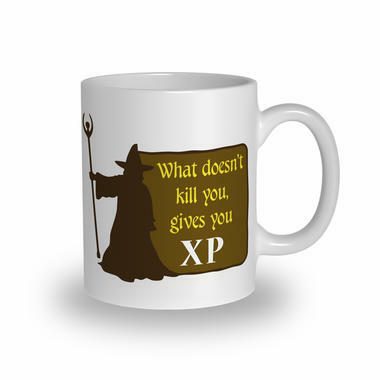 The "What Doesn't Kill You Gives You XP" Mug shows the most famous member of this elusive group: the grey wizard sent his own group away in order to grab all the experience points rewarded for slaying a giant fire demon. While this mug won't give you shiny new white robes, with its capacity of 300 ml, it will hold your daily dose of coffee or other healing potion of your choice. Hint: Unlike XP, don't share your drink with the other group members ;). 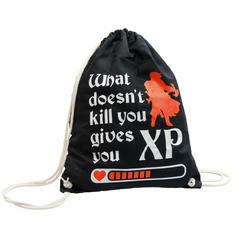 from 19.95 £ lade... Fair Geek Wear What does not kill you gives you XP T-Shirt Surviving brutal fights will surely enhance your experience. 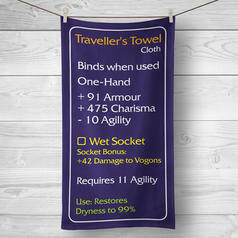 from 16.95 £ lade... Fair Geek Wear Roleplay Character DD T-Shirt +10 damage. 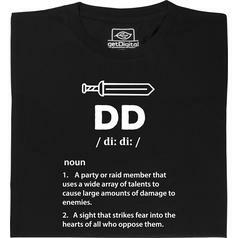 The perfect outfit for everyone who's ready to put the DD back into Dungeoneering and Dragonslaying.